By 1972 an increasing feature of Progressive music was the 'Epic', an extended song sometimes taking up the whole side of an LP (and occasionally more than one side): Pink Floyd's 'Echoes', Focus's 'Anonymous Two', and Jethro Tull's 'Thick as a Brick' being just some examples also from this year - the latter taking up the whole album! At this stage in their own progression, Genesis were not to be left behind. 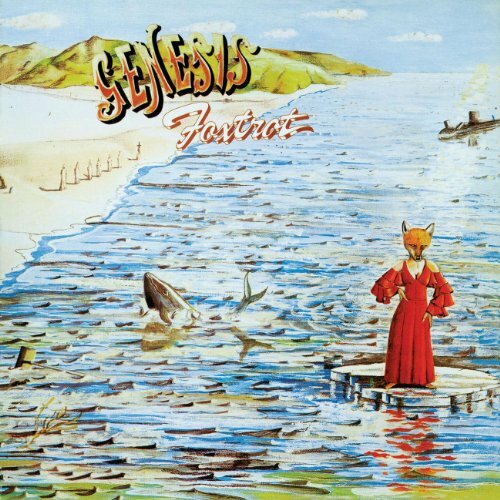 Foxtrot, the band's fourth release, is widely held to be one of the seminal albums of Progressive Rock, and as such it is not easy to come to it dispassionately. At its heart is the almost 23-minute epic, 'Supper's Ready' (to which I will return), some of whose content forms the inspiration of the third and final piece of album artwork by Paul Whitehead, whose style is almost as synonymous with Genesis as Roger Dean's is with Yes. The album opens with 'Watcher Of The Skies', and one of the most memorable and atmospheric openings to a song in the progressive canon: the extended concatenation of chords on the Mellotron morphing to the gentle introduction of bass and drums which builds to a staccato climax on the guitar as Gabriel's vocals kick in. The music ebbs and flows through various textures & rhythms, and Hackett's guitar comes to the fore in places, battling for dominance with Banks' keyboards. Written as humanity was taking its first tentative steps towards other worlds (well, the moon at least), and at the height of Vietnam and the Cold War, the song speculates on how those outside our planet might assess our track record and our ambition. But maybe with the benefit of hindsight, might this be just as relevant to the current climate change debate? Is the answer within ourselves and within our grasp, or do we need to look beyond - physically or metaphysically - for a solution? Time Table is a mellower piece, beginning with classical-sounding piano arpeggios before the lilting melody arrives. The guitars are quite muted in this song, but Rutherford's bass comes more to the fore, almost providing a counter-melody in places. This is a song of nostalgic reminiscence, perhaps inspired by a visit to an old castle or stately home (? ), but also of despair as humanity seems incapable of not repeating the mistakes of the past. One of the appealing features of Genesis's music is the subject matter which inspires their songs. There aren't many bands who would sing about property speculation and eugenics, but this band do in Get 'Em Out By Friday. This is another of their story/ dialogue/ dramatic songs (a la 'Harold the Barrel') and involves the dubious dealings of John Pebble and his enforcer Mark Hall, aka The Winkler, as they seek to make their fortune through property deals. Looking 40 years into the future the nightmare vision of genetic manipulation to keep people below 4ft in height, thus enabling more to be housed in the building land available, is presented: surely businessmen couldn't become that cynical and manipulative? As the now knighted Sir John continues to amass his huge fortune, the song ends with a hint that maybe there's more to life than wealth, as Satin Peter (Saint Peter?) urges Pebble to look towards higher things.Musically the song begins explosively and Pebble's lines are all delivered with energy and purpose. The Winkler, by contrast, is smoother and oilier, and the bemused tenant, Mrs Barrow just befuddled. The change in musical temperament helps to give the story greater substance, and the instrumental passage mid-song provides a wonderful pastoral interlude where life seems to be settled and trouble-free, a situation soon to be shattered by the announcement from Genetic Control. Can-Utility and The Coastliners delves into the realms of English history and the fabled account of King Canute, whose claim to be able to command the waves was proved to be fanciful. Here we are back to the 12-string sound that was a feature of the band's early work, which provides the background for the rest of the instrumentation. The instrumental section in the middle of the song is a wonderful combination of 12-string, bass pedals, Mellotron and drums which drives along with force and determination, as did Canute's misguided will. The music continues to build, as Hackett's guitar begins to dominate and the song reaches its dramatic conclusion. In a first for Genesis the next track, Horizons, is a purely instrumental one, and in fact a solo classical guitar piece from Steve Hackett (thought here played on a steel-strung acoustic guitar). Clocking in at under 2 minutes this is a dreamy, meditative tune which makes interesting use of harmonics and is still an integral part of Hackett's solo shows almost 45 years on. So with songs inspired by Science Fiction, history, capitalism and genetic experimentation so far, where could the band go next for grist for their compositional mill? How about to the apocalyptic vision of St John the Divine in Revelation, augmented with a little Greek myth and not a small amount of English whimsy? Such is Supper's Ready, an almost 23-minute piece which completes the album. I say 'piece': is it a single song, or is it an amalgam of seven shorter pieces run together carrying a connective narrative? Or maybe a single symphony in seven movements? Whatever! This is a song which has entranced, delighted and bemused for over 40 years, and is consistently rated as one of the greatest progressive rock songs ever made (it topped the recent Progzilla Radio listeners' poll, for instance). Supper's Ready takes you on an epic journey through the gentle, pastoral passages of Lover's Leap and The Guaranteed Eternal Sanctuary Man; the hard rocking interludes of Ikhnaton and Itsacon and their Band of Merry Men; the bizarre eccentricity of Willow Farm; the quintessentially proggy Apocalypse in 9/8; and the rousing denouement of As Sure As Eggs Is Eggs (with its promise of more to follow: a promise fulfilled in 1976's Los Endos?) This is a song which has inspired many others to stray into long-song territory, for good or ill, and has spawned a few closely-inspired tributes/ pastiches/ copies (Grendel, for one...), though Genesis themselves were not to stray beyond the 12-minute mark subsequently. This album marks a significant milestone in the band's development: their song-writing has reached a new peak with each of the band's members maturing as musicians. This would be the last album that was dominated as much by 12-string and Mellotron, as advances in synthesiser technology were to transform their sound in the coming months. With Foxtrot, Genesis were beginning to make an impact on the British music scene (though not as yet in the US) and this would continue in the next couple of years as their star rose steadily, and Foxtrot rightly holds a place at the top table of Progressive music as one of the best examples of the genre.